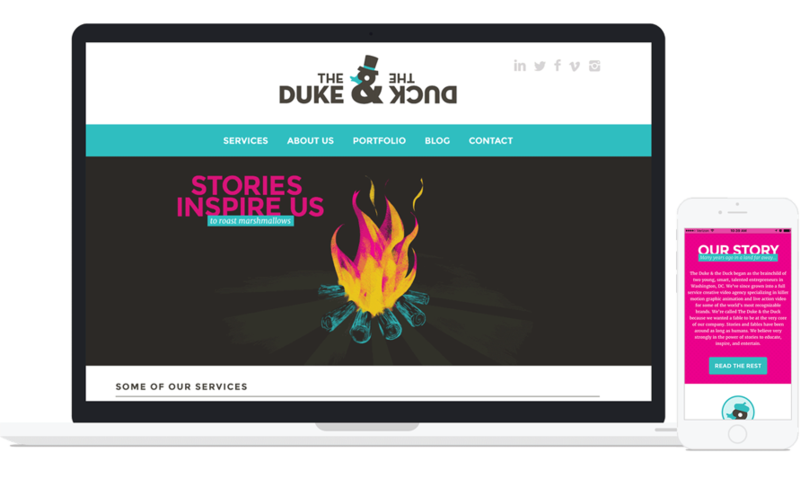 Our friends at the Duke & the Duck tell compelling, enter­taining, and informative stories through animation. They needed a brand and website to match their unique and effective sensibility, and we were happy to help. We created a fun and dynamic brand: a playful brand mark paired with vibrant colors and textures, bold type, and interactive website details. We channeled the fable-like background of the company name by combining their ampersand with a playful duck. Then we flipped their text, adding a quirk without sacrificing legibility. We hatched a whole flock of ampersand ducks wearing various charming hats and accessories, which allows the team to customize business cards, as well as key sections of the site. We channeled their knack for storytelling, writing witty site copy that gave new voice to their brand and carried the levity of the mark throughout their site and brand materials.